I've been building birdhouses for a couple of years. My showpiece is called The Lazy Day Saloon; however, most of my birdhouses are simpler than that. The one pictured here is somewhat typical of my work. Lately I've been making them with more slanted roofs and angled bodies. I'm always experimenting. I use cedar fence board from Home Depot. 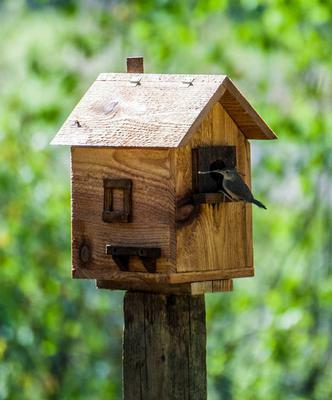 It costs about $2.30 a board and I can get a birdhouse from one board. I'm a school teacher for my real job, but after the craziness of my day or week, I enjoy time in my shop. Life makes sense when I'm in my workshop. My real point is that nothing is quite as gratifying as having someone install one of my birdhouses in their yard and have birds move in. I'm not sure the type of bird (maybe someone can write it in the comment section), but this picture was quite exciting and satisfying to me. I love building my bird houses. I give them away. All I ask is that you hang them. We live in a RV and travel, I put the houses up where ever we go. I also feed them. I have a battle with a squirrel right now. I set a place for the squirrels but they want to get into the bird feeder. I will win. Keep making the house I like yours. It could be some type of Flycatcher.